The Brush and Pencil tools are used for drawing and sketching. The Brush tool takes account of pressure sensitivity, allowing you to create lines with variable thicknesses when using a pen tablet, creating a contour vector shape. You can set different parameters, such as the size and smoothness of the Brush tool in the Pen view. Refer to Pen View to learn more about setting the Brush tool parameters. ‣ In the Drawing Tools toolbar, select the Brush tool. ‣ Select Tools > Drawing Tools > Brush. 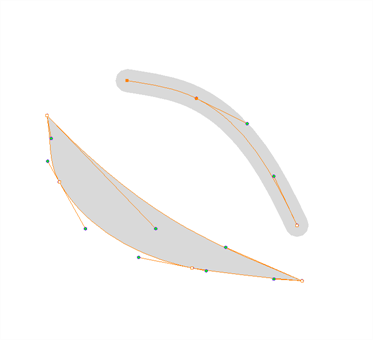 The Pencil , Polyline and Shape tools let you create a central vector line of uniform thickness. You can set different parameters, such as the size and smoothness of the Pencil tool in the Pen view. Refer to Pen View to learn more about setting the Pencil tool parameters. ‣ In the Drawing Tools toolbar, select the Pencil tool. You can draw with a Pencil tool and then convert it to a brush line using the Convert Lines to Brush option, and then you can modify its thickness using the Contour Editor tool. ‣ From the Drawing Tools toolbar, select the Select tool. 2. In the Drawing or Camera view, select the pencil line to convert and select Tools > Convert Lines to Brush. Refer to More Drawing Tools to learn more about the Contour Editor tool. You can convert a brush shape into a pencil line using the Extract Centre Line option. The brush line loses its thick and thin characteristics when is converted from a contour vector to a central vector type. 2. In the Drawing or Camera view, select the brush zone you want to convert and select Tools > Extract Centre Line.